Of all undesirable things to try to eliminate and to consider in a German Shepherd Dog before bringing it home with you, coat color should ALWAYS be at the bottom of the list. Good pigment should be sought after but many factors such as health, happiness, movement and temperament should always be so much more important than coat color itself. Coat color, in and of itself, should always be subordinate to structure, gait, type, and character and should never take precedence over the working abilities of the dog. Eye color should be dark and nose pigment should be black as well. Want to learn more about the German Shepherd? Check out my book below! Concerning the coat of the German Shepherd, the SV breed standard states the following: "The normal (stock) coated GSD should carry a thick undercoat and the outer coat should be as dense as possible, made up of straight hard close lying hairs. Ask just about anybody to describe a German Shepherd Dog and they will almost always mention the classic "saddle back" markings. It is also just as possible for the GSD to be one solid color such as black (solid white is considered a conformation disqualification for showing by the AKC) or sable. 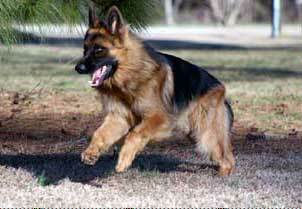 Sable German Shepherd coat colors are easily identified by multi-colored individual hairs all over the body. Sable GSD's may also be masked by dark or black guard hairs. “Blue GSD’s” - “Blue GSD’s” have very light colored eyes that may darken with age, grey noses (not black), and a grey 'dusty' overall look to their coat. This “blue” coat color is due to a recessive color gene that both parents must carry in order for the puppy to be born “blue”. At birth, German Shepherds that are blue in color will be a 'grey/silver' color, not the usual black. In other words, all the black pigment of the dog appears in shades of blues instead of pure black - they will have grey nose leather, and an overall grey 'dusted' appearance to their coats. 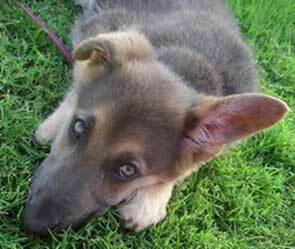 “Liver GSD’s” - “Liver GSD’s” are also caused by a recessive color gene carried by both of the GSD puppies parents. In this case, similar to the blues, all black pigment is replaced with browns or liver colors of various shades. Further, imagine a GSD dog that has brown nose leather, and a brownish colored coat, where it would normally be black in color. Also, this 'liver' color comes in a wide range of shades, varying from a very light brown to a deep chocolate brown. 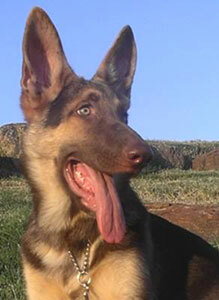 These GSDs also have light colored eyes which may darken with age, sometimes until they are approximately 7-8 yrs old. While I won't delve deeply into the science of genetics (feel free to do that on your own if interested), just know that the liver color comes as the result of matched recessives in the black series and the blue color happens as the result of matched recessives in the dilution series. For more information on liver GSD's click here. German Shepherd coat colors and inheritance in the GSD is very complex and controlled by several series of genes. Following is a very brief description and summary of the various gene series in the GSD responsible for color based on information from "The German Shepherd Dog: A Genetic History " and "Practical Genetics for Dog Breeders ", both by Malcom Willis. Both of these books should be considered as required reading for any serious German Shepherd fan and even more importantly for breeders. Another suggested resource is "The German Shepherd Today " by Winifred Strickland and James "Jimmy" Moses. The basic body color of the German Shepherd is controlled by the genes. The order of German Shepherd coat colors dominance is as follows: golden sable, grey sable, saddle marked black and tan, bicolor* black and tan (bicolor is where the dog only has tan on the legs and face, not on the body), and black. Additionally, know that the black gene is recessive to all the other colors in GSD's. 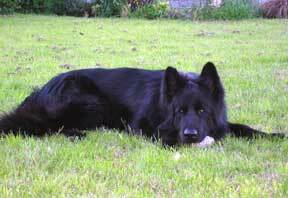 Solid black German Shepherds bred to solid black German Shepherds will only produce blacks. 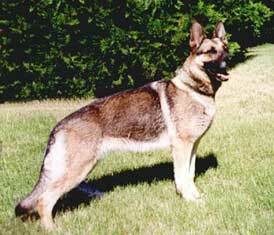 The sable colors are dominant over all the other colors and patterns in the German Shepherd Dog breed. This gene controls the black pigment formation on the GSD, not the hair color. The German Shepherd coat colors order of dominance is exactly as follows: Black pigment including nose, eye rims and pads; Carrier for liver color; Liver color - brown black colors, brown nose, eye rims and pads. 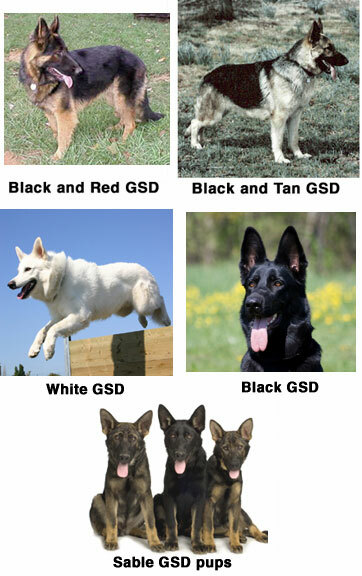 Note: most GSDs are considered black pigment including nose, eye rims and pads. White coat color in the German Shepherd Dog is recessive and also completely independent of the genes needed to produce agouti, two-tone, or solid patterns that occur in colored dogs. White coat color is also totally independent of either of the blue or liver dilution genes found in the German Shepherd Dog breed. 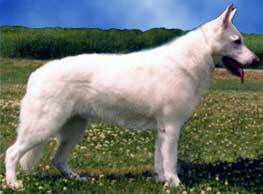 The white gene masks the genetic coat pigment of the German Shepherd coat colors, although it does not affect skin pigment. A good white GSD should have both dark eyes and a black nose and lips. In order to get a white coat color in the German Shepherd, both parents must carry the white gene (they must either be white dogs themselves or be carriers of the white gene). The order of dominance is as follows: Melanin is produced. (Standard GSD colors have this); Partial albinism (not seen); White coat with dark eyes and nose (not albino); Yellowish coat collar (proposed). This controls the intensity of the non-black coloration. The order of dominance is as follows: Lightest tan (cream); Intermediate tan (tan); Darkest tan (red). The intensity of the German Shepherd Coat Colors series determines whether GSD's with color (i.e. not all-black or all-white recessives) will be black & cream, black & tan or black & red. This controls how intense the black pigment will appear on your German Shepherd. The order of dominance is as follows: Dense pigment; blue dilution. Black pigment combined with blue dilution will produce a blue coated German Shepherd which looks as though it has a dusty or flour sheen to it. This controls whether or not a mask appear on your German Shepherd. 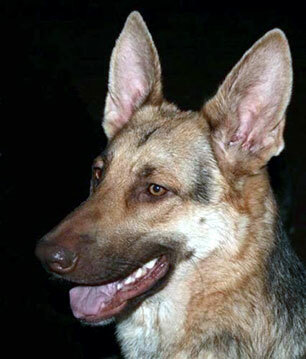 The order of German Shepherd Coat Colors dominance is as follows: a black mask on the face; dark coat with no mask; Brindle (rare, will be seen as striping on the legs); clear tan. All these genes put together determine your own German Shepherds coat colors. Short-coated German Shepherd's maintain a short coat, which lies close to the body. These dogs usually have less undercoat. 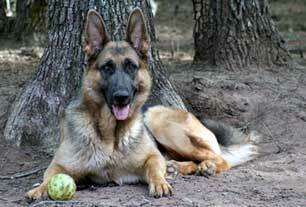 The Plush Coat German Shepherd has a medium length coat with a thick, fluffy undercoat. These dogs do not have any feathering as in the long coated GSD's. The coated German Shepherd, also called Long coated German Shepherd's, have much longer fur around their ears, on the backs of their legs, chest and tail (feathering) than other German Shepherd's.